Our uniform is an important aspect of our identity as a school and an outward indication of the pride students feel for themselves and their school. Our uniform reflects the standards of dress expected in professional environments and reflects the high expectations culture of our school. 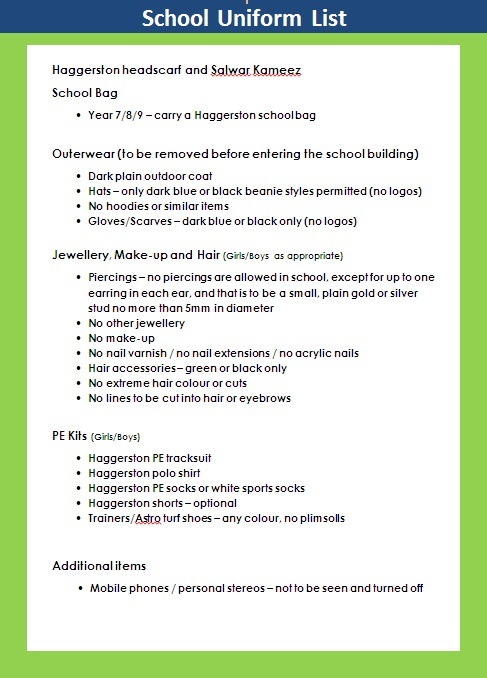 All pupils should come to school every day in neat and clean uniform. The support of parents in ensuring this is essential. Pencil Case, Black/Blue Pen, Green Pen, Pencil, Ruler, Rubber, Sharpener, Calculator, Protractor, School Planner, Reading book. On PE days, they are also expected to bring their school PE kit.